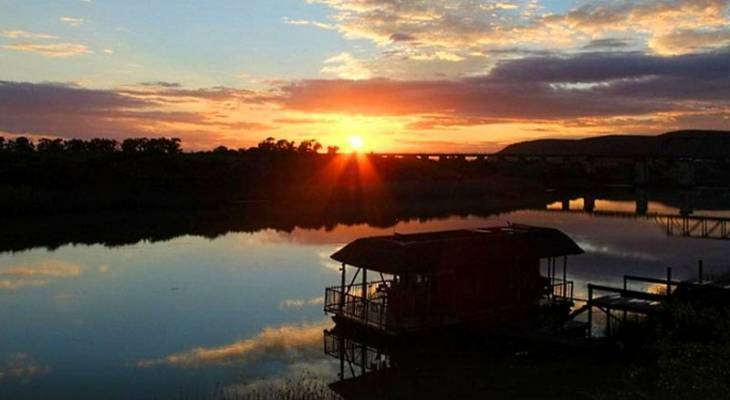 Situated just 3km from the southern gate of the famous Eastern Cape, Addo Elephant Park, the villages of Colchester / Cannonville lie on the banks of the Eastern Cape, Sundays River, nestling between magnificent sand dunes known as the Alexandria Dunefields. Teeming with wildlife such as bushbuck, bush pig, meercat and mongoose, these imposing, ancient Eastern Cape sand dunes reach incredible heights of 140m, and have stood tall for about 10 000 years, resting upon even older dunes dating back 100 000 years. In this largely unspoilt area of the Eastern Cape, just 20 minutes drive from the Sunshine Coast of Port Elizabeth, guests can enjoy the Sundays River meandering through the villages of Colchester / Cannonville on its way to the ocean, and stay at Colchester accommodation (Cannonville), where you can play and relax in luxury on the banks of the Sundays River - a haven of river, sky and bush, alive with the cries of birds and warmth of the sun. Visitors to Eastern Cape Colchester / Cannonville will enjoy a myriad of activities like water sports, fishing, canoeing, horse rides, quad bike adventures, lazy walks on the 38km of deserted beaches, and swimming in one of South Africa's largest tidal rivers. - Experience a unique river cruise on a Sundays River ferry, where 'birders' can enjoy a huge variety of birds and the beauty of one of the top rated estuaries in South Africa. - Cruise the Sundays River downstream to the Colchester / Cannonville Sundays River mouth and world famous coastal sand dunes, then enjoy a climb to the top of the dunes. - Go canoeing on the Eastern Cape, Sundays River, where you can experience both game and bird viewing on the riverbank. - For a truly amazing experience, explore Colchester / Cannonville and the Eastern Cape, Addo Elephant Park on horse back. - Many Cannonville / Colchester hiking trails afford the Eastern Cape visitor stunning panoramic views, and the opportunity to enjoy the peace and tranquillity of this lush corner of the Eastern Cape. - Situated closeby are numerous Eastern Cape Game Reserves, where visitors can experience the Big 5 - rhino, lion, elephant, leopard and buffalo, making Colchester / Cannonville a perfect destination for the outdoor nature lover with its close proximity to the Indian Ocean, as well as Eastern Cape Game Reserves. Colchester / Cannonville overview. Colchester / Cannonville Accommodation and Information.